Pearlie and the Big Doll is the park fairy’s latest adventure for younger readers. Pearlie finds a new visitor to Jubilee Park, a big doll. Pearlie tries to cheer the doll up, keeping her company and offering to host a concert with her animal friends. Everybody’s excited except the rats who weren’t invited to participate. It’s up to Pearlie to make sure the night goes according to plan. Pearlie’s fans will enjoy the visual delights of the concert, with wonderful illustrations. There’s a clever comedy performance that is a nice diversion from the music and dancing. Pearlie is definitely an excellent organiser and she peps up the performers in her usual chirpy style. Harmer doesn’t stray from her hugely successful formula here. It’s another event that Pearlie pulls off without a hitch. The deluxe edition of this book contains some ideas to make a Pearlie puppet show and there’s a neat paper doll to decorate too. Pearlie and the Big Doll is recommended for ages 6 and up. This looks just what I need for a little friend's Christmas gift. She will be six in Jan. Ideal. Thanks for visiting Buzz Words Books. 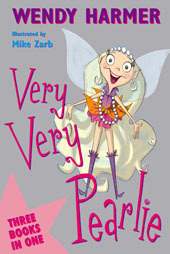 Pearlie is hugely popular in Australia (as are all fairy books). And what better gift for a child than a book.